What are all these weird dice? - Begindnd! - What is Dungeons and Dragons (D&D) about? You mean all those funny looking dice? What about when people say "d8" or "2d4 +2"? Alot of dice are used in Dungeons and Dragons used by both players and Dungeon Masters. This is to provide unpredictabilty and randomness to the game. When some asks you to roll a "2d4 and add your damage" don't panic. It just basically means to roll the 4 sided die twice, add the totals and then add your damage your character. Below are some explainations of uses of the dice and a video to help. 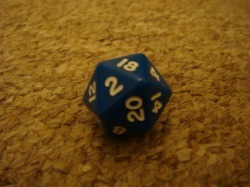 20 sided die or "d20"
This is probably the most commonly used die I use during my sessions. This die has 20 sides with numbers 1 to 20. 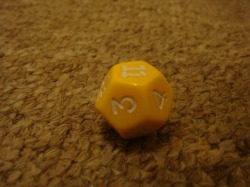 This die is mainly used to determine if an action succeeds or fails. For example, this die would be used for attack roles (to hit or miss) and skill rolls (succeed or fail at performing an action, such as climbing up a rock or reading a scroll). When you roll equal to or higher then the skill difficulty class (DC) or armour class you succeed or hit. As you level, you gain attack bonuses and you can invest points into skills so you can influence the outcome of the die roll making it more likely to succeed. Therefore, Ralik finds the loose brick whilst Warick fails miserably. 12 sided die or "d12"
I tend to nickname this the barbarians dice. Probably the least used die in the whole game. Barbarians use it to roll for their hit points when they level up and rolled to assess damage when a character is using a great axe in combat. 8 sided dice or "d8"
This die is used alot for healing spells. Whenever you want to cast a healing spell just have this ready in your hand. Also used to assess damage for weapons such as longbow and longsword. 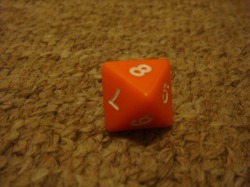 6 sided dice or "d6"
Finally a dice you can recognise! 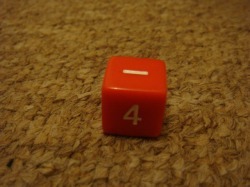 This is commonly used in a lot of board games and most associated as to how to define what dice are. In Dungeons and Dragons, this is used in alot of wizards spells, such as fireball and lighting bolt. Also used to assess the damage of weapons such as a light mace and a light crossbow. 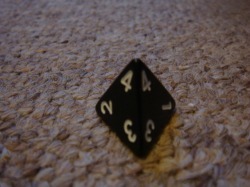 4 sided dice or "d4"
A pyramid looking dice that is mainly used in some wizard spells such as magic missle. Used for some weapons such as a dagger.